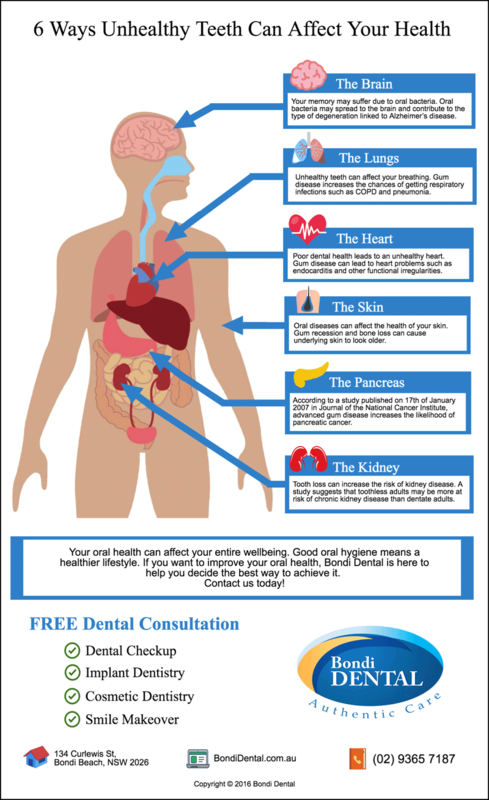 Why is it very important to maintain healthy teeth and gums and commit to your daily oral hygiene? It’s because there is a significant link between your mouth and your body, and this is supported by various studies. What happens inside your mouth will have an effect on your overall health. If you start establishing good dental hygiene habits today, you can prevent all these health problems later in the future. Encourage yourself, your children and your family to visit your dental team regularly and practice good dental care always. Doing so will not only protect your teeth and your smile. It can even save your life! Call us today on (02) 9365 7187 to claim your FREE Dental Consultation for a dental check-up, smile makeover, and dental implants. Bulk Bill Child Benefit Schedule Up to $1,000. Bondi Dental consists of a group of professionals who have combined experience of over 60 years in all aspects of dentistry.